If you saw my twins in the yard, you would never know that almost a year and a half ago we were in a self imposed quarantine and didn’t leave our bedroom or allow others to come in for about four months. No, I’m not joking. For four months, I obsessively monitored every object that came past my bedroom doorway, washing and sanitizing teethers, blankets and pumping equipment, and avoided physical contact with anyone that was not my husband or my mother. I nursed and pumped around the clock. I did this all in the name of the premature immune system, and avoiding cold and flu germs from school aged nephews and nieces, and commuter family members. By the spring of their first year, my girls came down to the living room and played at a distance from my young nephews. When my girls were born eight weeks early and at the start of cold and flu season, I did not hesitate to establish rules of contact and visitation with family and friends almost immediately after leaving the hospital. Family members would describe me as a germaphobe even before having children, so it was no surprise to them that I would be hyper sensitive to hand washing and contact when they realized I would be bringing home not one, but TWO fragile humans from the NICU. As I pick up spoons caked with avocado and beef off the floor and wipe them on a paper towel before returning them to the lunch bowl, I reflect on what a journey this has been. I have never feared fresh air and sunshine, just germs from other people and their tiny people. From the time the girls were a month old we were bundling up and taking regular walks all over the neighborhood, but we hung a small plastic stop sign from their stroller that we received as part of our exit packet from NICU, that read, “Please wash your hands before touching mine.” It was awesome. It stopped everyone from reaching in a grabbing baby fingers (which immediately go into their mouth,) and many people shared with us that they wished they had something like that when their children were small, because it becomes an awkward task asking strangers not to stick their hands in a baby’s face. Some people don’t mind at all, and some talk about how these encounters build up immunity. I kept telling people, one day they will be sneezed on, they will eat dirt, and will roll around with all of the other kids-their immune systems have some extra developing to do now though, even more so than a full term newborn. We’ll get there. When spring arrived and my girls were about four months old, I gradually allowed young cousins to interact closely with the babies. We set out a large blanket on the floor and big kids and babies could play on hands and knees or crawl and giggle next to each other as long as big kids washed hands and no one was sick. I did not allow any toys that went into the girls’ mouthes to be touched by the kiddos though. Unfortunately at this point, that was usually every object they encountered. If cousins wanted to hold babies, we’d wait till after bath time or when they were out of their school clothes and sports uniforms and washed hands. Kisses were on top of the head. Even with adults, I would place a burp cloth over clothing so the girls weren’t licking or laying on a dirty shirt. I continued to breastfeed, and we avoided several stomach bugs and upper respiratory infections. By the time it was summer, our requirements were simple: wash your hands before touching the babies, and if you’re sick, stay away. The baby toys were handled more, and the girls started playing off of their blanket and on foam squares or the carpet. We ate lunches and dinners on the front porch in our camping high chairs and spent a lot of time outside. In late summer, we took a big family trip and enjoyed floating in the lake and playing outside with our cousins. For their first birthday in November, we had a big birthday party with lots of family and friends. I was still nursing. The girls were passed around to everyone, but I still kept a close eye on anyone that looked ill. I would gently usher the girls away from a coughing adult or send kids to wash their hands when I saw them wipe their noses. Once H&G were walking, things got interesting! Walking and teething will break a mother that fears germs. Especially when there are twins and you cannot make your eyeballs move in two different directions simultaneously. Not only are they putting everything imaginable in their mouthes, but now they can get to it on their own, and sometimes in that instant you’re not looking! And one time I pulled a PENNY out of my daughter’s mouth. That could have been very dangerous, but luckily she gave herself away. We’re STILL teething, so I know the fun isn’t over yet! -No touching/eating garbage, whether on the floor or in the can. Even if we’re under the weather, we will always get sunshine and fresh air. We still want people to wash their hands when they come home from a store, a school, or any busy public place. We eat mainly organic foods, and my girls and I have been dairy and soy free because of allergies. 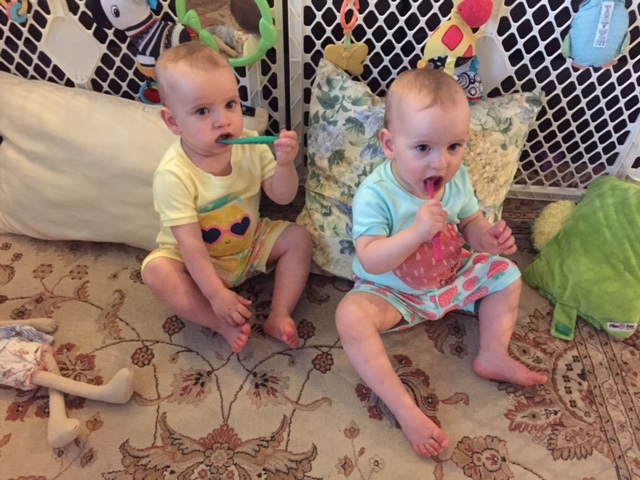 I very recently (at 18.5 months) stopped nursing my twins. This was bittersweet and I definitely cried. 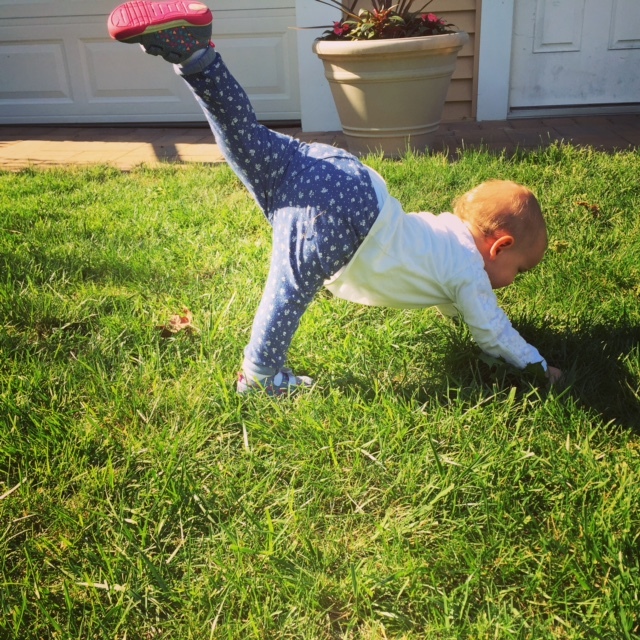 It marked a new stage for my growing girls and made me feel like my security blanket of providing that little extra immunity for them disappeared. I’m happy to say though, that at 19+ months we have lived alongside several flus, stomach viruses, upper respiratory infections, and croup, and have never been sick with any of them. 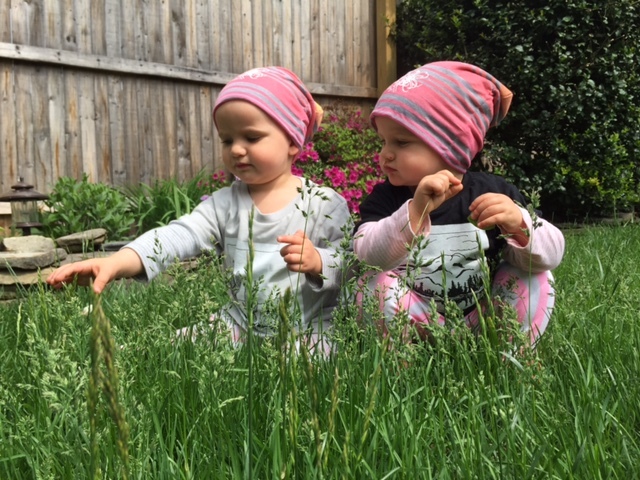 I hear that we’re bound to catch something between now and 24 months, but I feel like my girls have strong immune systems now. I’m so thankful that we were able to give that extra time to develop and ease into interactions with a very large circle of family and friends, and I am so thankful that I was able to breastfeed twins for as long as I did.